Why is it, that it seems, we Muslims, as a Nation, are almost afraid to use the word ‘love’. Is it because of it’s much over-use and abuse by many peoples and nations before and in our time or are we just afraid to talk about something we do not really understand? Certainly the ‘mystical Muslims’ (for lack of a better term), or those in touch with the inner spiritual Islam, have no aversion to using this word. But the vast sunni Muslim community (or at least, the community I’ve interacted with, which is primarily the Muslims of the Indian sub-continent, my own Island home and this multi-ethnic multi-national community of Muslims in Canada and the USA) seems to shy away from using this word. While I find it common in the language of leaders in other faith groups and even community groups, it is rare to hear it among our Imams and leaders. Nay, it almost seems as if talking of love is considered a weakness by the Ummah (an arabic work meaning ‘nation’ and used to denote the Muslim peoples generally) so our Imams shy away from it. At least this is my impression and I hope I am wrong! Allah is such a beautiful soft name. Meaning ‘Al-ilah’ or ‘The God’, with no plural form and no masculine or feminine form, it is a word beyond gender. Easily lilting on the tongue, easily breathed with the breath, easily sung in lullabies…’la ilaha illallaah’, that beautiful phrase that affirms a person is a Muslim, translated simply to ‘no God but Allah’ is such a soft and gentle thing. When we talk of Allah, we also use the word Rabb often. ‘Rabb’ is hard to translate, it has the meanings of one who nurtures, nourishes, sustains, guides, looks-after and yes, loves! It can be poorly translated as ‘Lord’ and implies one’s Master and complete source of all things. However, Master is a poor word as it has in it an inherent notion of gender, which in the Muslim theology, God is beyond. But my point was that we use the word ‘Rabb’ often and that word is full of the meaning of love. As a dear sister and mashaallah (by God’s grace) emerging voice in our community Sr. Yasmin Mogahed said, Allah loves you more than your Mother. Indeed Allah created mothers, and instilled in them this divine quality of love (it goes without saying this applies to Fathers just as much). We say, that all our good qualities are only small instances of the much greater divine. These are a few thoughts I wanted to share on the subject. 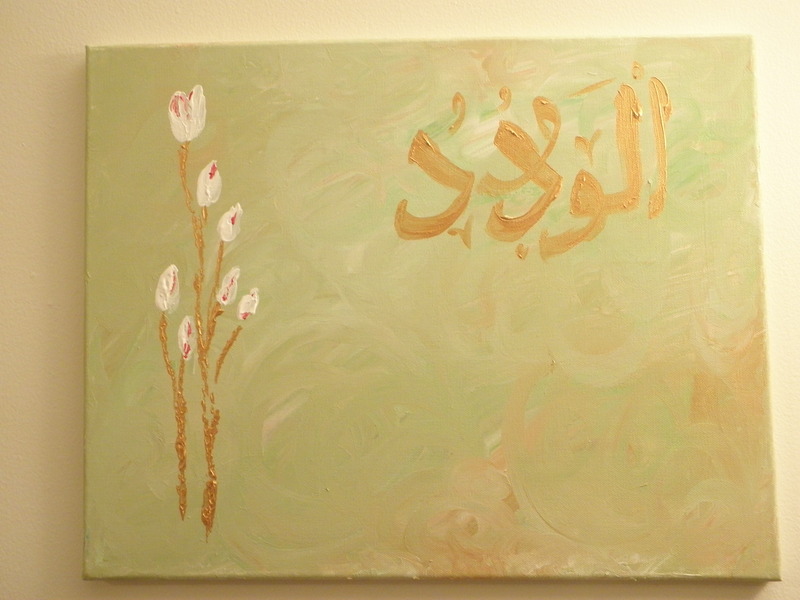 And attached is an image of a painting completed with Allah’s majestic ‘name’ of ‘Al Wadud’, ‘The Love’. It was inspired at a time when I was the recipient of love mashaallah and was deeply in that emotion. So I am grateful for that inspiration and grateful for what I recieved. That too from my beloved glorious Lord!!! So celebrating Allah’s name, and sharing that, is attaching this image. All good and all benefit is from Allah and Allah alone. So if any of you found anything good in this, that is by God’s grace and I am very humbled to be able to write and I do hope you find this beneficial for you.